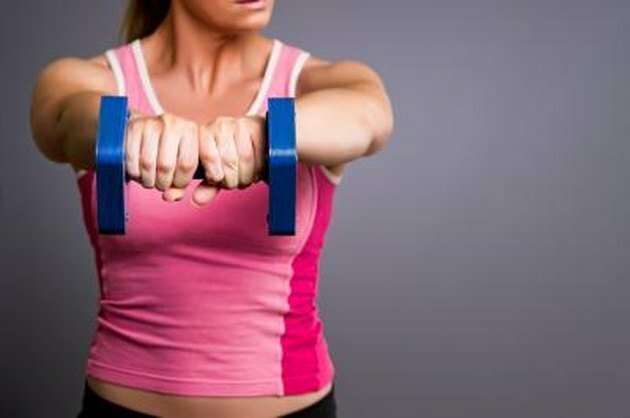 Exercises can be classified based on the engaged muscle's length and tension. Isotonic exercises involve an eccentric or lowering phase, and a concentric or lifting phase. Isometric exercises are those that have no joint movement about the joint but tension is developed within the muscle to support a load. Isotonic and isometric exercises can be used to develop strength, muscle size and muscular endurance while isotonic exercises are generally better for increasing functional strength. An isolation isotonic exercise involves movement around a single joint. Isolation exercises are used by body builders to target specific areas of their body. Examples of isolation isotonic exercises include leg extensions, leg curls, seated and standing calf raises, side lateral shoulder raises, front shoulder raises, pec deck flies and preacher curls. The primary muscle involved in initiating the movement is called the agonist and is the target muscle in this type of exercise. Compound isotonic exercises involve movement at more than one joint. 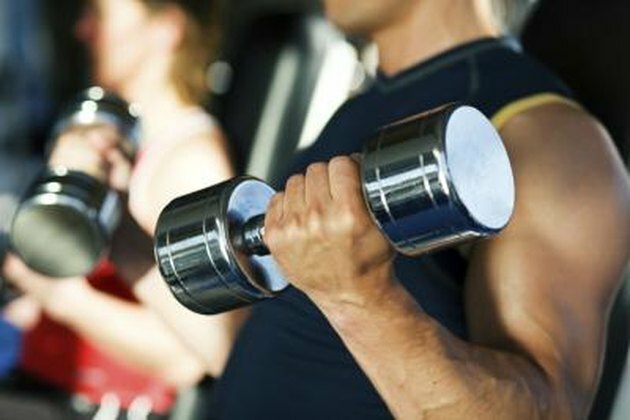 As well as requiring an agonist, compound exercises also recruit muscles called synergists to assist the movement. Synergist muscles tend to be smaller than agonists. In overhead pressing exercises, the agonist is the triceps while the synergist is the deltoid. Examples of compound isotonic exercises include pushups, pull-ups, barbell presses, squats, lunges and dead lifts. Compound exercises are more functional as they mirror everyday or sporting movements and have a carry-over to real life activities. Your lower body contains the majority of your overall muscle mass. A strong, well developed lower body can make everyday tasks such as walking, climbing stairs and standing easier. You can develop your lower body conditioning by performing isometric exercises. Isometric exercises do not require any equipment and thus are ideal for doing at home. This form of exercise was popularized by physical culturist Charles Atlas who designed a workout program based on static exercises that he called "Dynamic Tension." Examples of isolation lower body exercises include the wall squat hold, lying hip bridge, static lunge hold, static knee extension and knee squeezes against a pillow or small medicine ball. Although your upper body and core represent a smaller area of muscle than your lower body, these muscles are no less important. Strong upper body and core muscles help you lift heavy objects by supporting your spine, stabilizing your shoulders and encouraging good posture. You can increase your strength in your upper body exercises by performing isometric pushups, isometric pull-ups and self-resisted biceps curls. Isometric core exercises include planks, side planks, abdominal vacuums, wrestler's bridges and isometric crunches. There are also isometric exercise devices designed for this type of exercise including the Bullworker.